A good system of communication and weel-trained and prudent salesmen: this is another way in which SIRAL maintains high productive and qualitative standards. 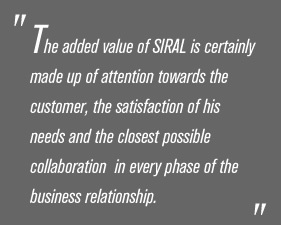 The relationship between SIRAL and its customers has always been excellent thanks to a post sales service supported by a structured internal and external communication system worthy of the products it makes. For a company like SIRAL, with customers all over the world, communication in real time is fundamental. For this reason its official website www.siral.com was launched in 1997 and is continually updated. This is augmented by an efficient electronic mail system. 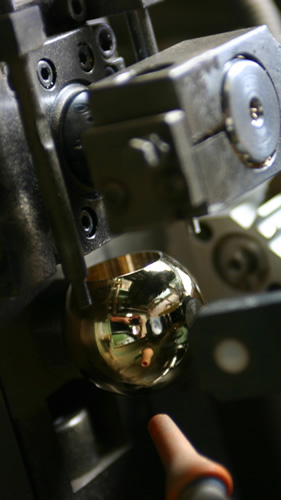 It si also worth pointing out the great flexibility of SIRAL, which complies with the tastes of its customers by personalising the finished products and creating different packaging according to their various requests. Precision and punctuality are appreciable even in the sensitive stages which precede and fullfill the delivery of SIRAL products. In fact, a distribution system has been set up which, thanks to complete control of the process, is able to adhere to the terms given to the customer by the commercial department. Actually, as well as using national and international carries, SIRAL has organized a network of its own vehicles to guarantee delivery in the shortest possible time.